CJ Group Chairman Sohn Kyung-Shik (3rd from right) poses with foreign ambassadors and EUCCK members. 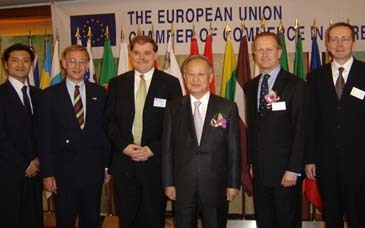 The European Union Chamber of Commerce in Korea (EUCCK) invited CJ Group Chairman Sohn Kyung-Shik for a speech at its luncheon meeting at Lotte Hotel in Seoul on April 27, 2006. Chariman Sohn also serves as chariman of the Korea Chamber of Commerce and Industry (KCCI). In the meeting Chairman Sohn delivered a speech on how CJ grew, its status in the South Korean market, and its plan for further growth. Among the VIP participants were Bulgarian Ambassador to Seoul Alexander Savov, British Ambassador Warwick Morris, Czech Ambassador Tomáš Smetánka, and Mr. Tim Oakes, CEO of Unilever in Seoul. EUCCK Vice President Peter F. Thewlis officiated the luncheon gathering as EUCCK's acting president. The following is the full text of Chairman Sohn's speech. Ladies and Gentlemen, I'm very pleased to introduce CJ Group to you today. For the next 20 minutes, I will address the company's vision for future growth as well as its history, and I hope this is an opportunity to bring you a better understanding of CJ Group. CJ has announced 2006 as the year of take-off for its globalization, and is ready to prepare the next step of the decade. Now, let me introduce CJ's history and management trends. In 1953, the people of Korea did not have readily available sugar. CJ stands for Cheil-Jedang, which means 'first sugar refinery.' CJ had originated its business from the sugar refining and importing raw sugar cane in Korea as the first manufacturing affiliate of Samsung Group. The company experienced early success and expanded its food production to flour, cooking oil, seasonings (including MSG and organic seasoning), meat processing and frozen food, which turned CJ into the leading food company in Korea. And then CJ actively entered lysine, animal feed and pharmaceutical market. The management strategy had been designed to move into adjacent business areas by leveraging core competencies and distribution networks of CJ products. For further growth, CJ made itself independent from Samsung group in 1993, and took its own course of business operation. In 1996, Korea entered the era of 10,000 dollar per capita income. Along with the higher standard of living, people made the more consumption in entertainment and service industry. CJ actively diversified businesses from manufacturing to service industry by foreseeing the future market trend and consumer demand. Accordingly, CJ expanded the business areas into Entertainment, Home Shopping, and Logistics, and these formed the current status of CJ Group. CJ Group now consists of five major business categories – Food & Food Services, animal feed& Biochemical products, Pharmaceutical, Entertainment & Media, Home Shopping & Logistics. As the leading company in Korea, CJ has achieved the revenue of 8 billion USD in 2005. The true driving force of CJ's great success is our unique culture and our people. Due to rapid growth and changes in the business environments, CJ needed a productive and energetic corporate culture, which could sustain its growth and people. Since CJ has very diversified business portfolio with different characteristics, the autonomy of the management of each business is essential. CJ was way ahead of other Korean companies in establishing a corporate culture that encourages creativity. We emphasize the respect for individual and have introduced new HR system which includes 'performance-based compensation.' To CJ, the corporate culture is not the goal itself but a corporate strategy to ensure best business outcomes, while making the work place enjoyable. I am proud to say that our unique culture along with the company vision has continuously put CJ Group as one of the Top five companies favored by amongst college students. Let me turn to address the future vision of CJ Group. First of all, CJ will secure world-class level competencies to reinforce our core business. To do so, we had resolutely restructured the non-core business which would be difficult to realize no. 1 or 2 market position in near term. On the other hand, we have strengthened the core business, which is food business sector by acquiring Hae-Chan-Deul (the traditional Korean food product company) and Seafood-processing company. Continuously, we will find the opportunity of M&A for further business expansion to the adjacent area to reinforce the strength of our business. As I mentioned previously, CJ will focus on expanding global business operation from this year and on. Based on our current international business experiences and strong corporate culture, we will further accelerate the globalization. Currently CJ owns and operates a number of global frontier units - 23 production sites in 9 countries as well as 30 regional offices in 8 countries, and CJ is rapidly increasing its global presence. We have actively expanded our animal feed business to global market by integrating its value chain. At present, we operate the animal feed mill in China, Vietnam, Indonesia, and Turkey, Chicken breeding farm in Indonesia, Hog breeding farm in Philippine, and lysine production plant in Indonesia and China. The third lysine plant will be built in Brazil this year. Besides the lysine production, CJ produces MSG in Indonesia and China. Recently, CJ Home Shopping has successfully entered the Chinese market. In the U.S., we are about to open a multiplex theater in LA, and the sales of the processed food targeting Korean-American community is increasing continuously. We've recently acquired Annie-Chun, a LA based Asian foods company, to capture a stronger foothold in the US market. CJ Group will achieve the revenue of 30 billion USD by year 2013, and about 30% of total revenue would be accomplished from the global market, which would establish the status of CJ as a truly global player. Also we will accomplish 3.5 billion dollar operating profit in 2013, continuously realizing the sustainable growth. So far, I've explained CJ Group's past, present and the growth vision for coming future. I would like to ask all of you to keep watching the continuous growth of CJ Group in the global market as I've mentioned today. I hope my short talk today helps you understand our company better. In closing, I would like to express my deep appreciation for your support, advice, and encouragement. I give my best wishes to you and your family.